(DALLAS) - The DSC Convention, Mogambo: Dagga Boy Danger, held in Dallas in mid-January at the Kay Bailey Hutchison Convention Center, saw a healthy increase in day traffic and brisk business for most exhibitors. 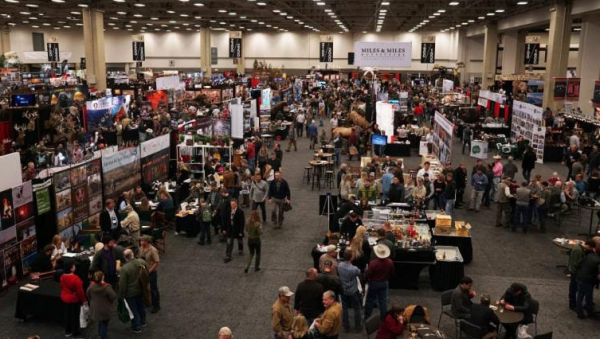 The Greatest Hunters' Convention on the Planet™ is one of Dallas' largest, occupying 850,000 square feet of exhibit space for four days. A special thank you to our corporate sponsors for their generosity and support of our mission. Sponsors of the 2019 DSC Convention include Sports Afield, Hornady, Bass Pro Shops/Cabela's, MidwayUSA, Trijicon, Inc., WildLife Partners LLC, Boyt Harness Company, Trophy Shippers, Alford Media, Lone Star Outdoor News, Blaser USA, Inc., Capital Farm Credit, Federal Premium Ammunition, Global Rescue, Michel Mantheakis Safaris Ltd., OX Ranch, RAD Rides, Rock Island Auction Company, GASTON J. GLOCK style LP, Lochow Ranch Pond & Lake Management, RAM, Swift Bullet Company, 5.11 Tactical, Arctic North Guides, Choctaw Hunting Lodge, EuroOptic, Ltd., Legendary Consortium, Trophy West Guide Outfitters, Scott Lake Lodge, Wild Hunting in Turkey, Adam Clements Safari Trackers, Adams Alaskan Safaris, Advantage Sales Promotion, Big Time Hunts, Core-Vens Insurance, McCallum Safaris Tanzania, Esplanade Travel, Heads Above The Rest Inc., Nicholas Air, North Island Guide Outfitters, Rungwa Game Safaris, Pro Hunt Concierge Ltd., John Tolmay - Bronze Art, Uganda Wildlife Safaris Ltd., Zander Osmers Safaris, Champlin Firearms, Inc., Dirk de Bod Safaris Namibia, J/B Adventures & Safaris, Beasley's Fine Jewelry, Patrick Mavros, Baranof Wilderness Alaska Lodge, Daggaboy Hunting Safaris, Edward Jones - Abe Nayfa, NRA - Women's Leadership Forum, Pascoe Gallery, Sean Lingl's Canadian Guide Outfitters Ltd., TAG Safaris, and Wild Arts by Raj S. Paul.